She was a devout Catholic and while I was raised as a Protestant and participated in many Protestant denominations over my lifetime, at one point I decided to explore the Catholic faith and am now officially a Catholic, though I attend sporadically at this point. Still, at the funeral mass the ritual washed over me in comforting waves…and the priest had known her for all of his life. His mother and her were in the same maternity ward giving birth to him and to my BIL. His parents were my BIL’s godparents and my BIL’s were HIS godparents. That loving and compassionate priest couldn’t get through the service without getting choked up on numerous occasions. While I was over there with my BIL on that horrific night that we found her, fallen out of bed, and had assisted him and stayed until the ambulance came, I did not go on to the hospital. I got the whole story later. She’d had a stroke and her heart was going in to failure but the tests showed a bit of infection and pneumonia setting in so it may have been a virus of some sort that heralded the end. She was taken to a local hospital and then life-flighted to one in Pittsburgh. She passed on early the next morning. Both my niece and Steve, my BIL, said that towards the very end a Presence and deep peace could be felt in the room and her attention left them and her eyes lit up and she began reaching towards the ceiling / air. This did not surprise me as I have researched near-death-experiences off and on over the years…. The “Wake” was held at her house and while many people contributed a wonderful variety of foods, there were two big ‘hits’ :) My BIL brought homemade canned pickles and peppers that were from his mom’s recipes, and the granddaughter that had come up from the south to stay there replicated her spaghetti sauce recipe, using the last of her canned tomatoes from the cellar. Meanwhile prior to this and afterward life went on. My oldest son is in Missouri but the two others were pallbearers. Photos of them, the kids on the weekend with their cousins at a local place where they can jump on trampolines, the twins turning 8 years old, and one of them stopping by for cookies…. Meanwhile the drone of lawnmowers permeates the neighborhood as it just did a few days ago…I and many of my neighbors mowed on Sunday or Monday, had rain, and are mowing it all again now. My back yard had lush grass that had grown a good 2-3 inches since Monday afternoon when I had last mowed. I had several Facebook memories from previous years on this date show up on Thursday of my son’s crazy dog, Koopa. Here, I had a nubby plastic furniture protector on the loveseat. That’s the signal for my older dogs to stay off of it. In the photo below, you can see that Lily took the hint and is on the floor in the corner. Koopa however, just worked around the situation! Like many of you while we had a few warm days ( actually 2 days that went to 80+degrees ) we’ve had no normal spring weather here. Mostly rain, sleet or snow. My crapapple tree usually has blooms that start out a deep pink, then they turn to white. I added a few more leaves and berries to the third border of my Flower Basket Medallion. VERY cold and blustery out / I gave up and brought it in for a picture…the wind just kept gusting! 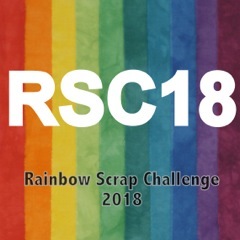 The Rainbow Scrap Challenge color suggestion of the month is yellow / gold. I enjoyed digging in to all of the lovely reproduction fabric that Susan had sent to me ( see previous post ) and I made an EPP gold Starflower and appliqued it to a background square. Another applique block in the works from the Dear Daughter project at Sentimental Stitches….and more hand quilting progress on my Rose of Sharon quilt. To see what others create this month in yellow / gold, visit Angela and other RSC participants on Saturdays. To view other hand work projects, visit Kathy for some Slow Sunday Stitching.